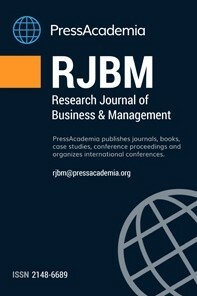 Research Journal of Business and Management (RJBM) is a scientific, academic, peer-reviewed, quarterly and open-access online journal. The journal publishes four issues a year. The issuing months are March, June, September and December. The publication languages of the Journal are English and Turkish. RJBM aims to provide a research source for all practitioners, policy makers, professionals and researchers working in all related areas of business, management and organizations. The editor in chief of RJBM invites all manuscripts that cover theoretical and/or applied researches on topics related to the interest areas of the Journal. RJBM publishes academic research studies only. Ethics Policy - RJBM applies the standards of Committee on Publication Ethics (COPE). RJBM is committed to the academic community ensuring ethics and quality of manuscripts in publications. Plagiarism is strictly forbidden and the manuscripts found to be plagiarised will not be accepted or if published will be removed from the publication.